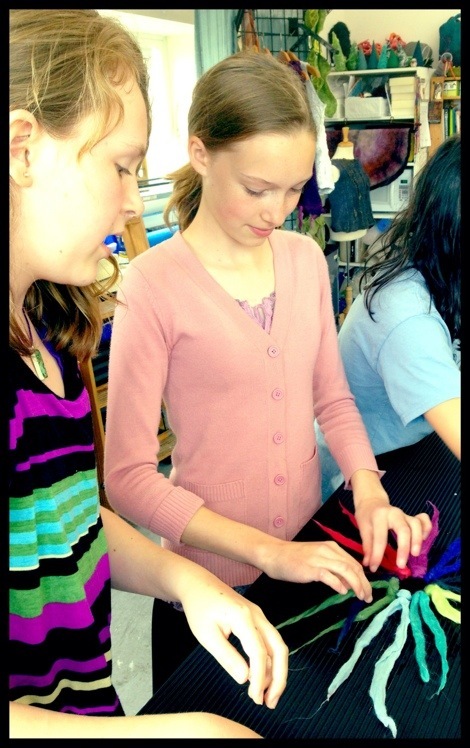 For my daughter’s twelfth birthday, we celebrated with a special party at my felt studio. It was the simplest and most fun birthday we’ve enjoyed together. Perhaps it was the fact that the girls were mature enough to chatter, sing and socialize with little wrangling on my part, perhaps it was the fact that my daughter has watched me teach so many times that she was able to teach her friends with no additional input. Several of the girls had experience with needlefelting, and a couple had tried making felt rocks at their elementary school. With little guidance, each girl felted her own set of feltilocks. After felting for an hour, we took a break for chocolate fondue, probably the silliest alternative to birthday cake yet. The girls weren’t ready to stop felting, so we pulled out some bars of soap to make felt soaps. The best part of hosting a party at my own studio is having the flexibility to change plans on a whim and indulge their flights of fancy. It felt like we had reached milestone when my daughter was able to plan and execute her party from start to finish. What a success. Adorbs! and happy bday little lady!